Our WPS-400 Ultra Low Loss coax cables perform better than the Wilson Cellular 9913 equivalent cable offering lower loss, better bending and handling characteristics and better weathering capabilities. Our expert cable assemblies department will custom make the cable to to length and with the connectors you need. Just select the length of cable and connectors needed from the drop down boxes above and our highly skilled staff will ensure that we meet your custom requirements. Because these cables are custom made to order, they are not returnable. Please double check your order for accuracy! 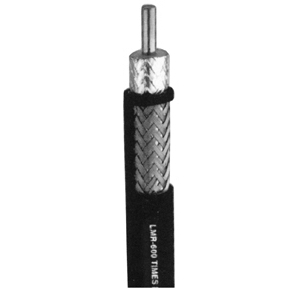 In the event that a particular cable length can't be made using Times Microwave WPS-400 we will contact you regarding alternative equivalent cable such as Andrew CNT-400 or Commscope WBC-400.